In determining a fishing rod and reel one must consider the species you are fishing for along with the type of lure or live bait to be used. 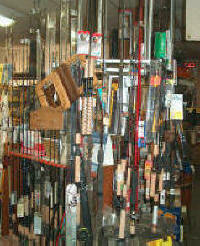 For instance your rod and reel set-up should match the fishing presentation. If you're pursuing panfish using light lures or small minnows your outfit should be lightweight for casting and detecting bites, not a heavy baitcaster for pike or bass. There are some basic categories of fishing rod and reel combinations, and within each there are multiple sub-categories of specialty types of outfits used for specific fishing applications, for example Walleye fisherman use rod and reel set-ups for slip bobber, slip sinker, jigging and trolling. Bass fisherman carry pitchin’, flippin’, crank baiting, and soft plastics combo’s. Muskie anglers have bucktail, jerk bait and top water outfits. In short, fishing rods and reels have come a long way over time, with new space age materials having been developed for rod construction making them longer and much lighter as well as reels with multiple ball bearings and one piece alloy and graphite frames. 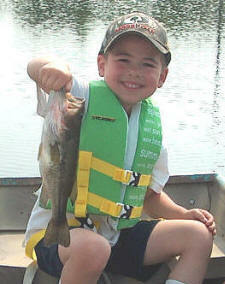 take a kid on a fishin' adventure. Tell us what type of fish your aiming at and we'll put you on target. Bass, Black Bass, Rock Bass, Striped Bass, White Bass, Bluegill, Carp, Catfish, Channel Catfish, Flathead, Crappie, Muskellunge, Perch, White Perch, Yellow Pickerel, Chain Pike, Northern, Pumpkinseed, Redbreast Sunfish, Sauger, Steelhead, Trout, Walleye. Eagle Claw, Blakemore, Blue Fox, Lindy Little Joe, Mister Twister, Berekley (Gulp Baits), Thrill, Wordens's Rooster Tails, Mepps, Acme Spoons, Joe Flies, Luhr Jensen, Terminator, C.P. Swing, Do-it Mold Co., Uncle Josh, Plano, Frabill, Snagproof, Johnson Lures, Northern King, Gaines Reef Runner, Cotton Cordell, Pradco, Storm, Yo-Zuri, Rapala, Rebel, Bageley, Arbogast, and hand made Musky Lures. largemouth bass, northern pike, perch, black crappie and bluegill. From Pits to Lake Erie fishing we have the supplies to help you catch that next trophy, don't let it swim bye. 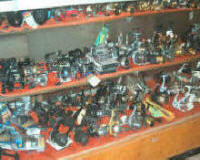 Spinning reels where commercially introduced in 1948 by Mitchell Reel Company of France. The design was of a fixed spool reel mounted below the fishing rod with a mechanical pick-up (wire bail) used to retrieve the fishing line. The anti reverse feature prevents the crank handle from rotating while fighting a fish allowing the angler to use the drag. In casting a spinning reel the angler opens the bail, grasping the line with the forefinger, then using a backward snap of the rod followed by a forward cast, the line is drawn off the fixed non rotating spool and not against a rotating spool such as a bait casting reel. Because of this lighter lures can be used where the weight of the lure does not have to pull against a rotating spool. Spinning rods have large fishing line guides to minimize line friction upon casting. Spinning outfits operate best using fairly light weight limp flexible monofilament fishing lines and are used for bluegills, crappies, perch and walleyes. Baitcasting outfits are excellent for many kinds of fishing, and come in a wide variety of options and types: Round and Low Profile, High and Low Retrieve Speed along with anti-reverse handles and line drags designed to slow runs by large and powerful gamefish. Baitcasting outfits are considered the standard when using heavier lures fishing bass, pike and muskie. All bait casting reels are mounted above the rod, when casting the angler moves the rod backward then snapping it forward, the line is pulled off the reel by the weight of the lure. In the early years of bait casting reels the angler used their thumb to control the amount of line travel as well as to prevent the spool overrun or backlash. Today all quality bait casting reels have a spool tension feature for adjusting the centrifugal brake, and or a magnetic ‘cast control’ to reduce spool overrun during a cast and resultant line snare called a birds nest.